Scotland averages 170 rainy days a year (famously wet Seattle: a mere 150). Heughan (with assistant director Mark O’Connor) says the conditions play into Jamie’s love of the land and work ethic. "What Jamie finds he shares with Native Americans [who become a major part of the story] is a connection with the earth, the elements and the seasons." Heughan, with Balfe and Lauren Lyle (as Jamie’s stepdaughter Marsali), re-wears a black suit from Season 2, but Jamie no longer carries a sword. Now, "weaponry is the pistol," he says. "It’s less about [fighting with] honor, more toward the Wild West." 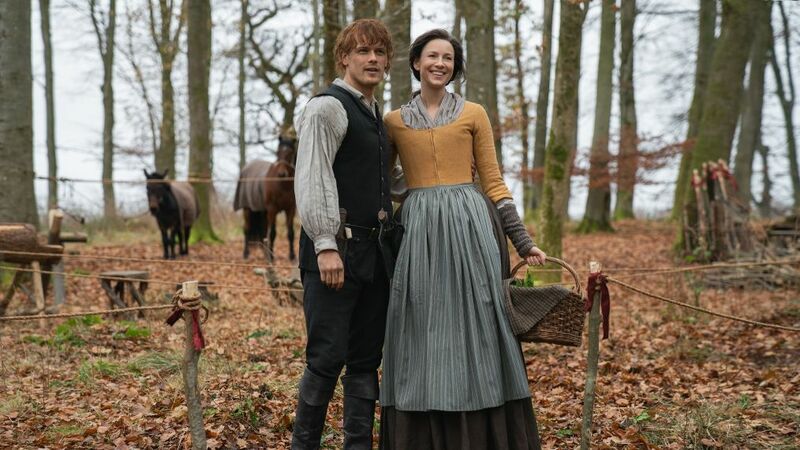 As for the women’s dresses, "It’s a lot of flowers and checks," says Dresbach, as opposed to the rich, vibrant colors Claire wore in Paris during Season 2. "This season, Claire has a little gray going on," says Balfe, getting her wig adjusted by hairstylist Anita Anderson. "It’s nice to play a woman a bit older. She’s only 51, but there’s maturity. This season is about creating a home. It was a good new challenge for me to develop her more nurturing side." Rankin and Skelton (with executive producer Matthew B. Roberts) prep for a scene set at a Scottish festival, where Roger and Bree join a traditional dance. Rankin, like most Scots, learned the moves in grade school. But, says the English-born Skelton, "I didn’t want to rehearse because Brianna’s not supposed to be very good!" The leads share lighthearted moments on- and offscreen. "It’s really quite fun to see the everyday stuff happening between them," Heughan says of Jamie and Claire’s more stable life at their homestead. Anything he didn’t like about his character’s time in the wilderness? "Try going bee hunting. I’ll leave it at that!" John Bell — Jamie’s adventure-seeking nephew Young Ian — hugs the Northern Inuit playing his sidekick, Rollo. "I wanted to make sure we bonded before we started shooting," Bell says. "I was at puppy-training classes with him twice a week. Plus, we had a trainer who helped me teach him commands." "It’s our biggest year by far," says Outlander production designer Jon Gary Steele of the spectacular sets and stunning locations showcased in Season 4 of the Starz drama, in which time-traveling Claire Fraser (Caitriona Balfe) and husband Jamie (Sam Heughan) settle in the New World. "We shoot in Scotland, but it has to be total Americana." Steele’s team built an entire colonial town, a Southern plantation house and the Fraser homestead in tartan territory. Are Bree and Roger the next 'Outlander' power couple? Maybe. Are these two actors completely adorable? Definitely. To make the cast fit into their surroundings, costume designer Terry Dresbach, who made upward of 1,000 ensembles, researched Colonial Williamsburg for inspiration on 18th-century ladies’ dresses — and drew on her personal experience for the 1970s styles worn by the Frasers’ daughter, college student Bree (Sophie Skelton). In the December 16 and 23 episodes, Bree drifts further from her boyfriend, Roger (Richard Rankin), while her parents mingle with British colonial leaders. Click through the gallery above for a behind-the-scenes look at Season 4 filming!